Published: Dec 1999 to ? 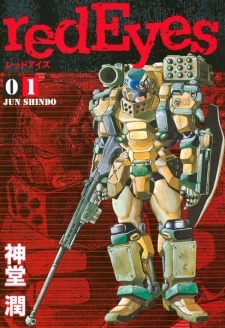 One mobile suit infantryman's personal battle resumes as a red fire blazes again in his eyes! Betrayed by his own men, Captain Grahad Mills, a commander of the SAA Special Force "Jackal," is held responsible for a conspiracy about which he knew nothing. Without defense counsel at his court, he is sentenced to death. On the morning of his execution, he escapes the military detention center; in the process blasting a troop of national military guards and killing its commander—Captain Waldman, his former subordinate and betrayer. All this is for revenge and to find out the reason for the treachery. The former hero—feared and known as "Genocide—starts to fight a battle he created by himself. Red Eyes are one of mine most favorite mangas. The most outstanding thing in it is amount of work done to create and describe the world, it's political and historical background. And it's very realistic in description of military, it's command structure and equipment. Only SAA are new, but they are working on it (in real life). The weakest aspect of the manga is it's characters and story. They are very good, but most people we get focus on are 'elite of the elite supermen''. Until vol 9 we got single individuals, very strong, but believable. After that author is droping in one after another and in comparison to Graham Mills they are not. Seriously - the amount of 'one-man-army' guys is getting to overwhelming and is little affecting the storyteling IMHO. Overall - great manga, waiting very patiently for ne chapters. If you a military fan - you must read it or just take a peak. You won't regret it. This is my first ever review. I'm sorry for poor grammer or spelling. RedEyes is about the protagonist, Captain Grahad Mills a commander of the special forces "Jackal", he is betrayed by his own men and wants to seek vengeance after years of imprisonment. Captain Grahad Mills is feared and known as "Genocide" because he's literally a killing machine. Rumors says he took down an entire squadron by himself. This manga is something I would recommend to action fans. To me, this manga is the same vibe as Berserk because it shows the becoming of age theme. I believe it is a becoming of age because it shows how Guts (from Berserk) became from a slave to a famous swordsman. In RedEyes however, the protagonist was a farmer (if I remember correctly) and there is a war going on at the same time, he is recruited by the Captain and slowly progresses to becoming a solider. Basically this is the modern version of Berserk with rifles, rockets, missiles, and military suits. Hey fans of Red Eyes!